Business non-fiction is one of my favorite pastimes. Reading the advice of successful people always feels like time well spent. Taking People With You leaves me with a great respect for David Novak, the Executive Chairman of YUM! brands here in Louisville. He was CEO at the time of the book’s publication. It’s a public version of the leadership training Novak has taught to the many franchisees and company leaders for Yum and PepsiCo over the years. In particular, I really enjoy Novak’s third section on following-through on goal settings and properly measuring and rewarding your employees. It actually made me look at the tools we use at Automattic and think “hey, we’re totally doing this right,” because we gather so much data on everything we do. It’s refreshing to read advice and realize your company is totally living it. The first section of the book is a little fluffy. One of my least favorite things in the business genre is how so many authors tell you to ‘use this book’ a certain way. In my opinion, if you can’t find value in a 200 page book reading it cover-to-cover, it’s not a good book. This was enjoyable, so I don’t accuse Novak of having a poor product, rather I wish he’d ditch the pretense of ‘read only one chapter a day maixmum’ or ‘use this as a workbook.’ Stand by your ideas as just that – ideas – and they’ll hold up a lot better. Similarly, lots of Novak’s examples fall into the trap of an executive presenting himself as the main character of a narrative. Realistically a lot of people were surely involved by committee, by meeting, and certainly implementation for many of the examples and stories presented. Leadership is why we’re reading the book, but it takes a lot more than the CEO saying ‘we should have Wing Wednesday’ in one meeting to make Wing Wednesday happen and all those little actions don’t really get mentioned. When beginning a new undertaking, think through your strategy, then its structure, then the culture that can make it happen. 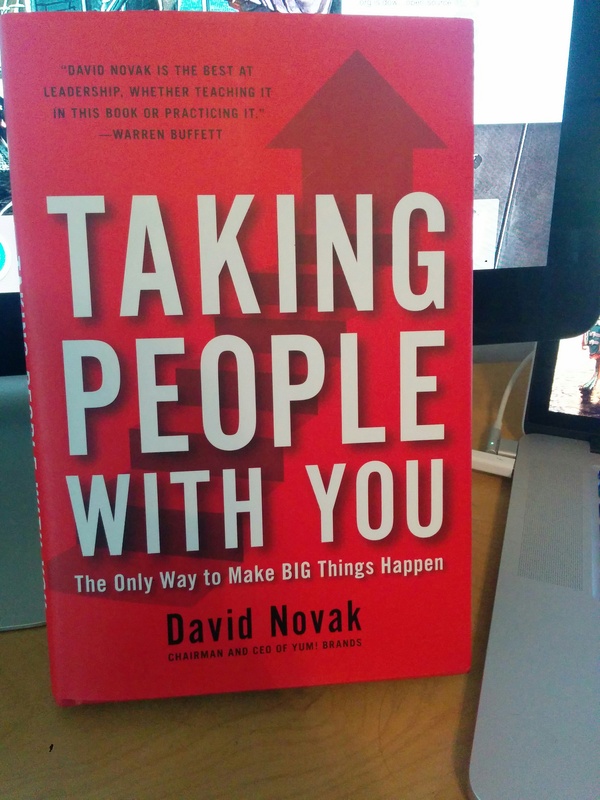 David Novak is the best at leadership, whether teaching it in this book or practicing it. Buffett and Novak have lunch at KFC once a year, apparently. Now that’s a lunch I’d like to join one day. Thanks to my mother-in-law, Dana, for recommending the book and loaning me her copy of it. 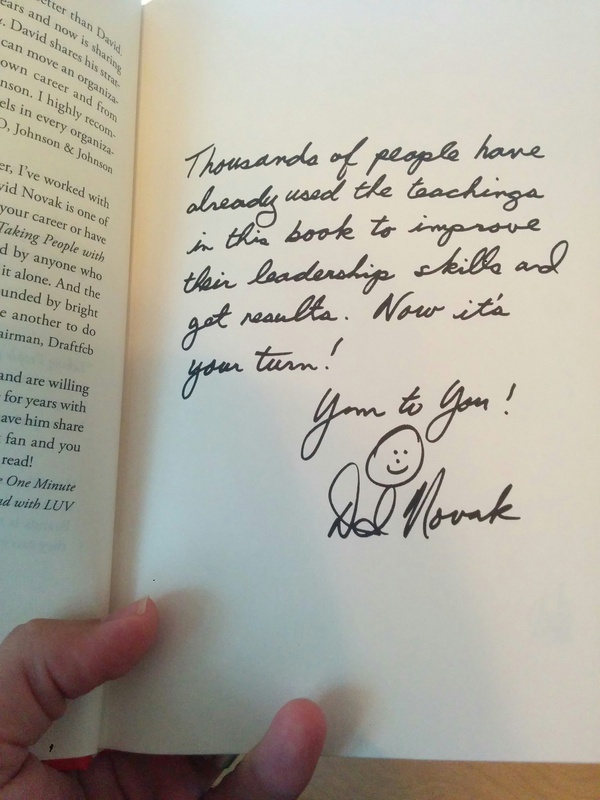 She had the pleasure of meeting Mr. Novak and receiving a signed copy. “Yum to you!” is a pretty great inscription. I really enjoyed reading your perspective of Novak’s book. Are you planning to share your thoughts on any more?